And they all lived somberly ever after. Rather than physical death or even incarceration, the principal characters of FX’s The Americans were left dying on the inside at the close of Wednesday night’s series finale. Elizabeth and Philip Jennings (Keri Russell, Matthew Rhys) are back in the USSR and wondering what might befall them. Their children, Paige and Henry (Holly Taylor, Keidrich Sallati), remain in the USA with the knowledge they may never see their parents again. FBI agent Stan Beeman (Noah Emmerich), the dogged Lt. Philip Gerard of The Americans, is left with the guilt of letting his quarry escape while also wondering whether his new wife, Renee (Karen Pittman), could be a Soviet spy. And what about Philip’s tragically duped informant, Martha Hanson (Alison Wright), who was smuggled off to the Soviet Union before the feds could apprehend her? Did she in fact adopt that orphaned girl she seemed to take an interest in during a cameo earlier in the sixth and final season? But, with Roseanne notwithstanding, we’re in times of a reboot/revival mania. So your friendly content provider tried to reopen the door at the end of the interview session. Can Fields and Weisberg emphatically say The Americans is over and out? “We feel it’s done,” Weisberg said. OK. But what if FX came calling five years down the road with an enticing offer to continue The Americans in some form? 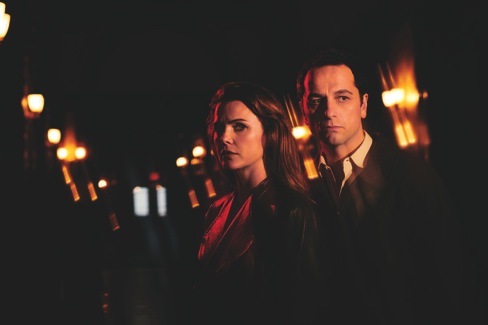 Fields and Weisberg said they had no idea how The Americans would conclude until near the end of Season One. At that point, “we suddenly got a very clear sense of the ending of the show,” Weisberg said. Still, how exactly would they get there? In that respect, the prolonged parking garage confrontation between Stan, Philip, Elizabeth and Paige had to play just right, in the producers’ view. Because otherwise, “the whole ending of the show didn’t work,” Weisberg said. So they kept revisiting it, rewriting it. “It took a long time to get there,” Weisberg said. But Philip preys on his friendship with Stan, who by happenstance also was his neighbor throughout the series. He also lies about having never killed anyone while in the U.S. “We had a job to do,” he pleads. And in the end that job entailed saving Mikhail Gorbachev from the KGB, which wanted to overthrow him. He invites Stan to shoot him if that would resolve matters. Philip otherwise is emphatic about the three of them driving off rather than giving themselves up. Stan relents, and it likely will be debated at length whether this was a believable or wise creative move on the part of the producers. Bonnie and Clyde eventually got their comeuppance, as did Butch Cassidy and the Sundance Kid. But did viewers have the same rooting interest in Philip and Elizabeth, who left dozens of dead bodies in the interest of what they perceived as a greater Communist cause? Elizabeth and Philip eventually make it back to the USSR while daughter Paige secretly hops off of the train they were sharing before it heads out of the U.S. toward Montreal. She is last seen sipping vodka at the former residence of veteran Soviet spy Claudia (Margo Martindale), who had been helping to tutor her. “We’ll leave it to the audience to decide whether this was punishment enough or satisfying enough,” Fields said. The final scene of The Americans otherwise plays beautifully. Philip and Elizabeth get through a final Soviet checkpoint before asking the driver of their car to pull over. They emerge and then gaze at a skyline in the distance. It’s been a while. “They’ll be OK,” Elizabeth says of Paige and Henry. “We’ll get used to it,” Elizabeth assures him, shifting to their native Russian language. And that’s the way it’s left -- even if there’s so much more to say. But for now, Dosvedanya. Postscript: The Americans was not a ratings hit for FX, but did become the network’s most acclaimed series, at least by TV critics. But it has won just two Emmy awards in its first five seasons, both for Martindale in the guest actress category. The Americans is in some stellar company, though. HBO’s The Wire never won a single Emmy while NBC’s Homicide: Life on the Street didn’t get a single Best Drama Series nomination and won just one acting Emmy, for series regular Andre Braugher.